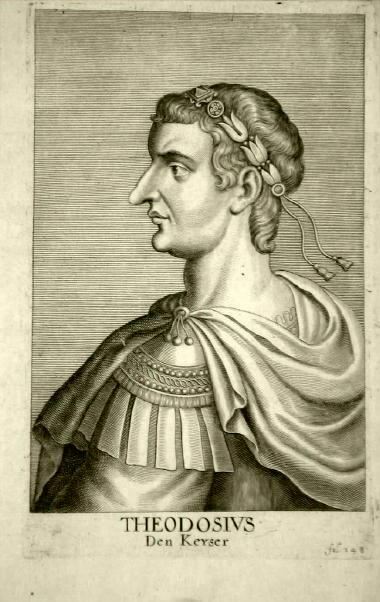 Flavius Theodosius Augustus, also known as Theodosius the Great, was Roman Emperor from AD 379 to AD 395. Theodosius was the last emperor to rule over both the eastern and the western halves of the Roman Empire. He issued decrees that effectively made Orthodox Nicene Christianity the official state church of the Roman Empire. He neither prevented nor punished the destruction of prominent Hellenistic temples of classical antiquity, including the Temple of Apollo in Delphi and the Serapeum in Alexandria. In 393, he banned the pagan rituals of the Olympics in Ancient Greece. After his death from disease in 395, Theodosius' young sons Arcadius and Honorius inherited the east and west halves respectively, and the Roman Empire was never again re-united. (2) Theodosius I 379-383 A.D.